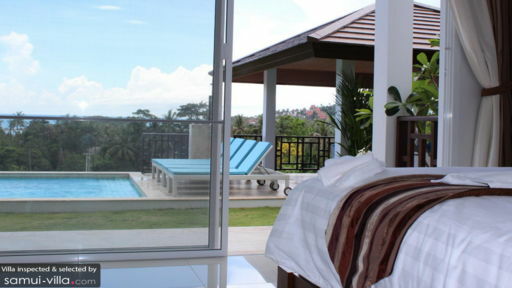 Villa Samui Sky is a lavish tropical home with modern interiors and natural outdoors. Equipped with comfortable indoor spaces that interact well with Samui’s beautiful landscape, the villa offers guests a chance to live amidst unmatched nature. 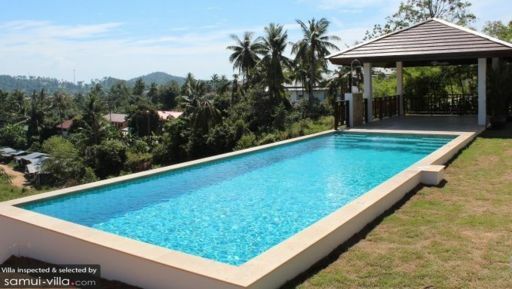 Found only five-minutes from the shores of Choeng Mon beach, rest assured that the location is ideal. With sprawling gardens, the villa even makes provision for your children to have room to play around. The infinity pool is the jewel of the villa with unparalleled views of the bay area and Koh Fan Noi in the distance. The villa is home to three bedrooms that are located on the two floors – the master bedroom is on the same floor as the living and dining area whereas the two remaining bedrooms are located poolside. The bedrooms are designed to incorporate the outdoors within their walls with sliding glass doors that open to reveal scenic views. Furnished with king-sized double beds or twin beds, the bedrooms are similarly designed with air-conditioning and ensuite bathrooms. The ensuites are fitted with facilities like bathtubs and/or rain showers amongst other things. Nestled amidst the luxurious natural surroundings of Koh Samui, Villa Samui Sky features an expansive garden teeming with verdant flora, trees and blooming flowers. Amidst the heady natural fragrance, guests can swim and splash around in the infinity swimming pool so you can sit back and take in the awesome views of the bay area. Right next to the pool stands a poolside sala with outdoor seating. Guests can relax here during the evenings to watch the sunset with a glass of wine or simply catching up on old stories with friends. A veranda that leads to the downstairs bedrooms comprises the alfresco dining area at the villa for guests to enjoy a delicious breakfast next to the garden. 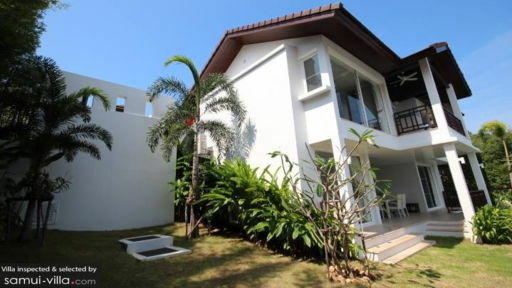 Villa Samui Sky is spread over two floors and the living and dining area are found on the first floor whereas the swimming pool and garden are on the ground floor. The living area is also adjoined to a terrace so you have a stunning view no matter where you are in the villa. Open-plan, airy and designed with soothing colours, the living area is essentially inspired by the island. The plush sofas sit facing the TV and DVD player so you can watch your favourite movies in the air-conditioned room. Outdoors on the terrace, you have more sitting options to choose from. Indoors, there is a second dining area for formal dinners or for times when you wish to eat in the comforts of your cool living space. The kitchen at Villa Samui Sky is well-equipped with top of the line appliances and fittings to ensure you can prepare a meal in no time even if it is in the middle of the night. Eat your way through Samui as Choeng Mon beach and its neighbouring areas are teeming with popular restaurants and cafes that serve delicious local Thai food and fusion food. Some of these include June’s Art Café, Secret Garden and Noori for delicious Indian food. If you want to be wowed by spectacular views then Pagoda Khao Hua Jook offers 360-degree panoramas of the coastline. Chaweng beach is also close to Choeng Mon, another place where you will find several restaurants, cafes and bars.